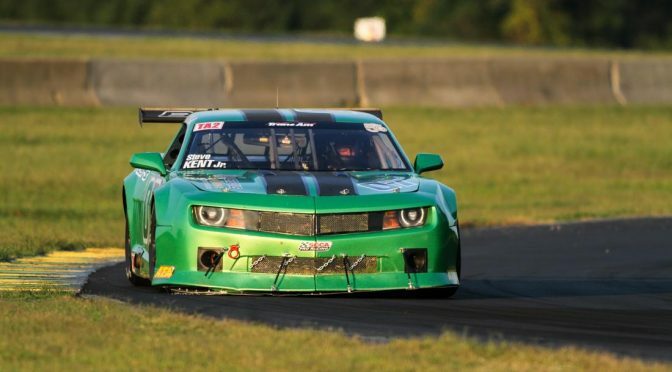 With only one car and a new driver, BCR was unsure how the weekend would play out at beautiful Virginia Raceway for round 9 of the Trans-Am championship. The regular driver of the BCR/Millers Oil Chevy Camaro was trying a ride in a competitor’s TA2 car, which left us scrambling to fill the seat. A few phone calls later, Steve Kent Jr. hopped on board and we were looking forward to renewing our relationship. Steve drove for us before, but has not been in a TA2 car in over 18 months. As testing was cut short by rain, and practise was only 20 minutes long, neither car nor driver were 100% for the qualifying session, ending up a lousy (for us) 13th. We made our final changes and prepped the car for the race, knowing that the #07 Green Machine and Steve will be good in race set-up. By lap 1, Steve was up to 11th place, and within 10 laps he worked his way up to 6th. His pace was great, and we were holding him back to save the car for the last 10 laps of the race. Unfortunately, on lap 15, a car being lapped pushed Steve off the track, causing massive splitter damage and a clogged radiator. As such, we had to pit to clear the rad and evaluate the splitter, and sent him back with a wounded car. To Steve’s credit, he again worked his way up to 6th, where we would finish, and we ended up the last car on the lead lap, a testament to our pace! Thanks Steve for a job well done!